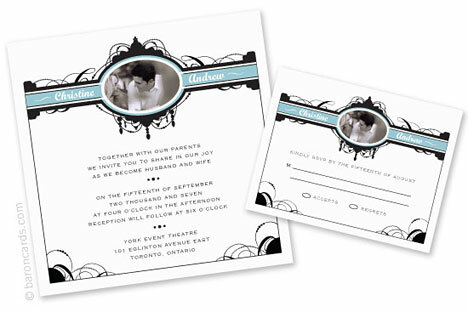 If you're one of the growing number of Canadian brides who wants to make environmentally-friendly choices for your wedding, invitations are a good place to start. 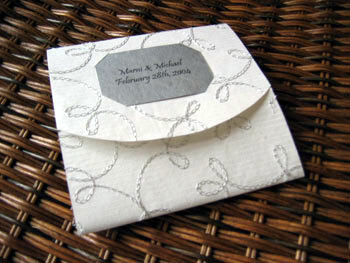 But before you begin addressing dried paper towels with a mud-based ink pen, why not take a look at the fabulous assortment of eco-chic wedding invitations we found? Each of the following designs makes an effort to help the environment in its own way, and proves that you don't have to compromise style to go green! Made with vegetable-based inks on 100% PCW (Post-Consumer Waste) recycled paper, this "Chandelier" design is a stunning eco-chic option. We found it at Baron Cards, who actually claim to price their wedding invitations and stationary up to 25% less than the competition because they operate completely online. This "silver swirl in white" design is also made from 100% PCW products and also certified by the FSC Forest Stewardship Council, to assure responsible harvesting of fibres. It comes from the green line of invitations from Calgary, Alberta's With Your Touch. 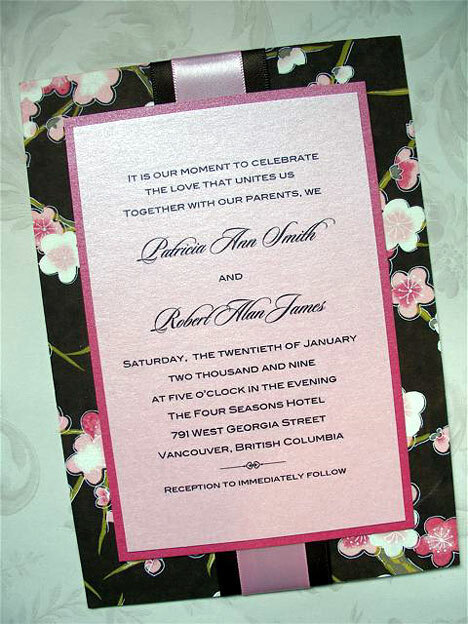 Themed invitations, such as this Japanese-style blossom design demonstrate that you don't have to scrimp on style to do your part for the environment. It's made using at least 30% PCW, courtesy of Port Moody, BC's Paper Artistry. Lastly, two additional referrences to help you take an eco-conscious approach to your wedding. Check out this environmentally responsible wedding planning service, Green Coast Weddings, as well as this Vancouver couple's earth-friendly efforts for their big day, for some great ideas.